MakeupbyEesha: Made these raved about mascaras work, that, otherwise didn't work (for me)! Made these raved about mascaras work, that, otherwise didn't work (for me)! A lot of times we are so intimidated with some products that we just want them to somehow work. We try all the hacks possible to make them work, sometimes we succeed sometime we don't. Generally, I am very positive person with immense fighting spirit and I don't give up on anything easily. So, this post is about one such small incident from my tryst with and for the love of make-up! Ever since I stared wearing make-up and learned about all the brands, I wanted to try the Armani Eyes to Kill mascara water proof (to be able to wear during monsoons). To rest my desire, I ordered the mascara from Selfridges, paid so much duties and shipping to realize that this was not worth the hype at all. This was just a dud. No volume, no lengthening, no blackness! Nothing close to what it is hyped about. And then started the struggle to somehow make it work to subside the pain of shipping and duties gone in vein. Then I remembered about another dud, the Legendary Lash mascara by Charlotte Tilbury. I got a sample of this mascara from amazing Beautylish with my latest order. I tried the mascara as soon as I opened my Beautylish package in the evening and I washed it all off in a few minutes. Guys, the drama was legendary, the volume, the lengthening and pigment was impeccable and there's nothing close I have tried before. However, many YTers claim this to be a dupe for Chanel Le Volume, which I have't used in hot minute, so no comments on that. Next day I wore to office to experience the horror of my life. The mascara rolled all over my face. This was awful guys leaving me embarrassed! I was very disappointed that such a beautiful mascara didn't work for me and it went somewhere back in my stash. You can probably make out from my arm swatches as to how pigmented and jet black Charlotte Tilbury mascara is. So, when my Armani mascara failed and was trying to figure out a way to make it work, I remembered a wedding tutorial by Charlotte Tilbury herself in which she had topped mascara with a water proof top coat. Just like we seal our nail polish, I guess. And, then I experimented and tried the Armani Water Proof mascara over Charlotte Tilbury Legendary Lash mascara and anxious waited for that moment to see the mascara all over my face, but, fortunately this wait never got over and by the evening there was sense of victory. Yes, I made it work. No mascara fallout/ rolling over. Ever since, this has been go-to lash make-up. In my eye's picture below trying to show the mascara in action, I have worn just one light coat of the Legendary Lash mascara and topped with the Eyes to Kill Water Proof mascara and you can see the volume and pigment. I feel that this was quite an expensive experiment and I wouldn't recommend these mascaras, individually, to anyone. Decide for yourself, if you want to try the combo, but, IMO why would anyone in his sane senses buy a water proof mascara from overseas to use as a water proof top coat. I would not at least. But, if you do not struggle with mascara's running down your face, do give the Charlotte Tilbury Mascara a try. 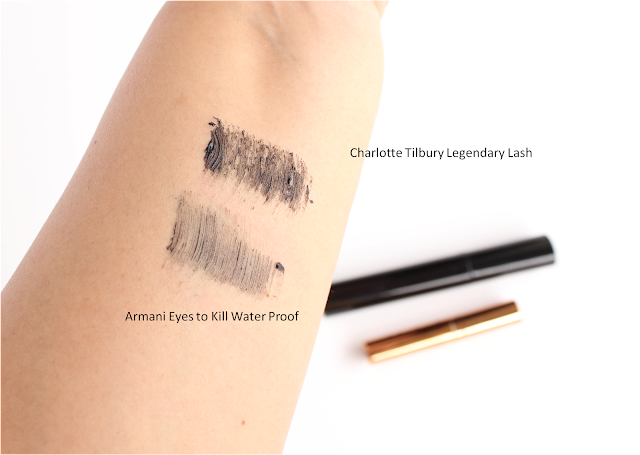 Charluotte Tilbury, if, you ever read this post please release a water proof variant for your Legendary Lash mascara. PLEASE! I hope you guys like this post. Do you have any such experiences of making product work, which otherwise were a dud? Lets chat in the comments below. Amazing makeup look. Liked it.